The Mackenzie District is renowned for its breath-taking mountain views, stunning turquoise blue glacier lakes and rivers, its wide tussock landscapes in the high country and green rolling hills in the basin - and its clear starry nights, the Mackenzie District has always been an attraction for people to visit, live and do business. In contrast to its small population (4,158 residents 2013 census), the area of the district is large, comprising 745,562 hectares and covers 7,339 square kilometres of diverse landscape. Named in the 1850’s after James Mackenzie, a Scottish-origin shepherd and sheep thief, the Mackenzie District is located right in the middle of the New Zealand’s South Island. The extreme forces of nature created significant landscape features which form some of the districts natural boundaries. 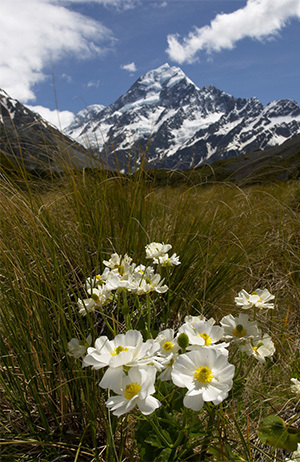 The Main Divide of the Southern Alps with New Zealand’s highest mountain “Aoraki/Mount Cook” (3,754m) in the north-west and the Two-Thumbs Ranges in the South-East. Little Mount Peel are as far as the district stretches to the East and Lakes Ohau and Benmore border the district in the south-west. Mackenzie is truly a district of four seasons with clear, crisp snowy winters and long, hot summers. Autumn is known for being a festival of colour, while spring amazes with wild flowers and seas of lupines blooming throughout the region. Although dominated by agriculture and farming, the diverse landscape is a paradise for outdoor lovers with hiking and cycle trails, skiing, rock and mountain climbing, kayaking and hunting for the more ambitious, fly fishing, salmon farms, pleasure boating, golf, horse trekking and star gazing on the more relaxed end of the scale activities. Renowned for the clarity of its sky and freedom from light pollution, the Mackenzie area was declared a gold-level International Dark Sky Reserve (IDSR) in 2012 by the International Dark-Sky Association (IDA). For an action packed family day trip, weekend getaway or longer fun filled experience, base yourself at Twizel, Glentanner or Mount Cook Village in Aoraki/Mt Cook National Park, Lake Tekapo or Fairlie to enjoy a vast range of activities for all ages and budgets. The Mackenzie District has a vibrant economy filled with innovative business people. It has enjoyed strong economic growth recently of over 7% (2012) deriving predominantly from high quality agriculture production. Mackenzie District Council is the local government authority, its main office in Fairlie and support office in Twizel. Services include Planning & Regulation, Asset Management, Finance & Administration and Community Facilities. Hours: Monday through Friday 8.30am to 5.00pm. There are numerous lifestyle choices and business opportunities throughout the area. The township of Fairlie is the farming service centre of the district and southern ‘gateway’, Twizel has the largest population and is the ‘gateway’ to Aoraki/Mt Cook National Park, while Aoraki/Mt Cook Village and Lake Tekapo host hundreds of thousands of international and domestic visitors each year. It’s not surprising new residents and business investment in the Mackenzie District is strong. If you’re considering business start-up, an established business with plans for growth or diversification, or simply want to bounce some ideas about business in Mackenzie, contact South Canterbury Chamber of Commerce. Overview of our services. Learn more about doing business in South Canterbury.